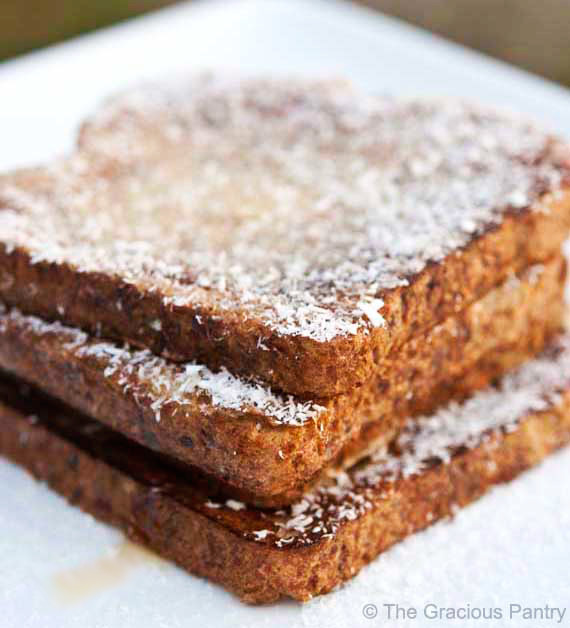 French toast is awesome. Don’t you think? I mean, who ever thought of soaking some bread, getting it all gooey, and then cooking it? Whoever it was, they were brilliant. Just brilliant. I’ve developed a rather strong love affair with coconut over the last couple years. I used to hate it. Couldn’t get me within 10 feet of something that had coconut in it. But that all changed after I had fresh coconut for the first time, and it’s been all downhill from there. I use it whenever I can! In a medium size mixing bowl, whisk together the egg whites, coconut milk, vanilla extract and cinnamon. Submerge the bread in to the mixture, being sure to turn it several times to get all sides coated and wet. Using a non-sick pan and a very light coat of olive oil from a sprayer, cook on medium heat until the bread is cooked through, paying special attention to being sure that the egg and the middle of the bread slices are cooked through. Put the toast on a plate and sprinkle each piece with 1 tbsp. of the coconut flakes. Add a little honey to taste and serve. Teeny – Hope you enjoy it! Mary – It might! Let me know! Andrea – Hope you enjoy it! Jennifer – Yes, it’s in the breads category. Hope you enjoy it! Heidi – Hope you enjoy it! Stephanie – I buy the Trader Joe’s California Protein bread. I believe it has molasses in it, but it’s a clean sugar, so I eat it. I try not to overdo it. Alyson – I would start with what sounds good. Pastas are usually well received. I wish you all the best! TDFC – Hope you enjoy it! OMG…this was awesome…I had it with some pineapple chunks…it was delicious!